Choosing accommodation in Marrakech can be a bewildering experience. With hundreds of options to choose from, it is difficult to know where to start. We've painstakingly researched and reviewed countless Marrakech Riads and this is a short guide to our favourite places. The first thing to consider when trying to arrange your accommodation, is budget. For clean, but basic accommodation within the medina, you can find accommodation for as little as £25 - £35 per room per night. For the more upmarket riads, you can expect prices to start at around £60 per room per night to around £200. For luxury hotels, prices will start at around £300 per room per night. Location: Old or New Town? The location of your accommodation should also be a major factor in your decision. Marrakeck is a city of two halves; the new, modern city and the ancient walled medina. Hotels in the new town consist of hotel chains and upmarket resorts, often with a golf course and swimming pools and , of course, the world famous La Mamounia. Unless you really have an urge to stay in a large resort, then staying in the medina is highly recommended. All of the sights are within easy walking distance, the souks are right on your doorstep and you can go everywhere by foot. Accommodation in the old town comes in the form of traditional Moroccan houses, or riads - houses built around an inner courtyard. Riads are brimming with atmosphere and offer a truly unique experience to visitors to Marrakech They are normally fairly small, on average they have from 3 – 6 rooms, and they vary in price from the budget to the luxurious. Rooms usually overlook the courtyard and each bedroom is decorated in an individual style. Riads also benefit from roof terraces, offering a wonderful location for an al fresco breakfast. Staying in a riad isn’t for everyone, however. Access is often down small alleys, called derbs, which, whilst perfectly safe, can feel intimidating to first time visitors. Added to this, the streets are rarely well sign-posted and good maps hard to come by, so staying in one requires a degree of trepidation. Whilst children and families are often welcome, riads can be hazardous, with balconies and unattended pools, so parents need to keep an extra close eye on their children when visiting. After many trips to Marrakech, we have decided to offer only riad-based accommodation for our holidays, as we feel they offer a unique and atmospheric experience. We have hand-picked a selection of our favourite riads in Marrakech. They are all in walking distance of the main square, the Djemaa el Fna and have all been visited by one of the members of our team so you can be sure that they offer something a little special. If your preferred riad is not on this list, please contact us to discuss your options. We have organised the riads into broad categories based on their price. What you need to remember about accommodation in riads is that they are small, individual guest houses and come with their own quirks. Plumbing should be reliable, but in the summer months the smells from the medina can at times waft into the bathrooms. As mentioned, many are located in small alley ways which, upon first visit, can seem a little intimidating. Use pricing as a guide to quality. In the luxury category, you can expect beautifully furnished rooms with exceptional service. Mid-range riads should be clean and have friendly service, but will have less elaborate fixtures and fittings. Riads in the luxury category go above and beyond to provide guests with a comfortable and relaxing stay. At this level, you can expect sumptuous décor, immaculate attention to detail and exemplary service. If you usually stay in 4* hotels, then these riads are for you. They have an upmarket hotel feel, but still individual enough to make your stay unique. Riad Adore is a stylish contemporary Riad located just a minute's walks from the Souks. It has just five bedrooms, each looking onto the central courtyard where there is a small plunge pool. Meals are taken on the roof terrace complete with open fire for ccool nights and shade for hot days. A beautiful hotel tastefully decorated and furnished with love and tlc. Located in the south of the city, it is within easy access to the main sights of Marrakech and the main square is an easy 10 - 15 minute walk. An added bonus is that the hotel benefits from car access, meaning you can be dropped off just outside the door. Inside the hotel, there are 17 rooms, all of which have been individually decorated, with excellent attention to the interior design. There is a good sized pool with sun loungers and a spa with hammam. Communal areas include a winter and summer salon and a cinema room where you can watch dvds on a large screen. Upstairs, the roof terrace is huge, with plenty of space to spread out, it even houses a small gym for those who like to work out with a view. When staying in Marrakech, it is worth spending a little more to stay somewhere special and our selection of boutique riads prove that you don’t have to break the bank to stay somewhere chic and romantic. Our hand-picked collection of boutique riads are all well-located, within 10 minutes of the main square and all offer an oasis of calm from the chaotic souks. Many of them are located along small derbs, or alleyways, making their approach feel a little less than salubrious. However, the minute you enter, these stylish, yet cosy riads will feel like home. All centred around a courtyard, you can expect thoughtfully presented rooms with stylish décor. Communal areas, such as salons and roof terraces are a must and many have additional extras such as wifi and hammams. Some of our riads have a plunge pool, which is a nice to have in the summer months. For winter stays, relaxing in a lounge with a roaring log fire is a nice way to end the day. At this type of riad, you can expect helpful and friendly staff who will be more than happy to book meals for you and come and meet you if you get lost. If you normally stay in 3* hotels, but want to treat yourself with something a bit special, but unpretentious, then this category is right for you. This cool and charming riad is about 10 minutes from the main square, close to the Medersa and the Musee de Marrakech. As with many riads in Marrakech, it is accessed down an unlit derb (or street). Once you know where you are going, you won’t have any problem finding it, but the staff at the riad will give you a hand-written map to show you the way to the square and will help you to get your bearings when you arrive. If you do get lost, you can just call a member of the riad staff and they will come and find you and bring you home! With six bedrooms and 2 generous salons, this is a larger riad, with some gorgeous communal spaces. This riad is suitable for both winter and summer visits, the salons are cosy, with log fires and the patio offers a shady retreat from the summer sun. The indisputable wow factor for this riad is its roof terrace, with far-reaching views and lots of space to spread out. - Two of the rooms (Beldi & Berber) are accessed via a communal stair case, ideal for older families. - Communal Areas: 2 salons, peaceful courtyard, large roof terrace. Just around the corner from Dar Hanane is Riad Tzarra, a 4 bed riad, about 10 minutes from the main square. As with many riads in Marrakech, it is accessed down an unlit derb (or street). Once you know where you are going, you won’t have any problem finding it, but the staff at the riad will give you a hand-written map to show you the way to the square and will help you to get your bearings when you arrive. If you do get lost, you can just call a member of the riad staff and they will come and find you and bring you home! An intimate riad focussed around a courtyard with a small plunge pool, the décor is beautiful with exemplary attention to detail. (The bathroom in the Colonial room is fantastic) On the first floor of the riad there is a large salon with a cosy fireplace for winter nights. The salon is fully equipped with satellite TV, DVD player and music centre and honesty bar. The roof terrace is decked out with tables and chairs, sun-loungers and a shady pergola with comfortable sofas for relaxing. - Communal areas – 1 salon, peaceful courtyard, roof terrace. A 10 minute walk to the main square, this charming riad is in the west of the medina in the Bab Doukkla area. It is beautifully maintained and has a stunning central courtyard and chic interior décor. An added benefit is a small pool in an adjacent courtyard, allowing you to cool off on sunny days. With lovely communal areas and a romantic atmosphere, this riad is one of our favourites. For families or groups of friends, there is a small apartment offering 4 / 5 beds and a communal lounge. - 7 en-suite rooms – 1 family suite (sleeping 5), 2 Doubles, 3 twins/ Doubles and 1 single. - Communal areas: Roof terrace with sun loungers, TV room, pool courtyard & central courtyard. - Additional features: Wifi, air con, All rooms (except the single rooms) have hair dryers & safes. The suite & Room 1 have their own TVs. A small, intimate riad located about 5 minutes from the main square. This riad is really easy to find and very well placed for exploring the medina with less chances of getting lost! The riad is beautifully furnished and the staff are attentive and friendly. If you are a medium sized family, then renting this riad as a whole makes for a lovely base. A lovely 5 bed riad, in the Mouassaine area of Marrakech, about a 5 minute walk from the square and close to the souks. The riad as restored by a British author and sculptor and the thoughtful interior décor gives a chic, yet cosy atmosphere. The views from the roof terrace are magnificent, with a panoramic vista of the Atlas Mountains and the Koutoubia. This is a fabulous option for couples looking for a romantic break in a good location. - 5 rooms – 1 twin & 4 doubles. All rooms can have an additional bed. - Additional facilities – plunge pool, hair dryers in each room, wifi, complimentary tea. - No children under 8. There are literally hundreds of riads in Marrakech and many of them aim for this price bracket. Some offer a good standard of accommodation in a great location, others are patchy. We have hand-picked a selection of our favourites. In this price range, you can expect a good standard of accommodation, akin to what you would expect in a 3* hotel. All of these riads are arranged around a courtyard patio, some even have a pool. Rooms should be clean and well-presented, but without some of the more elaborate décor that you would see in a boutique riad. All of the riads offer a roof terrace and at least one other communal area. Staff will speak either English or French (or both) and breakfasts will consist of fruit juice, tea / coffee, bread & jams. Sometimes you will also be offered fruit, eggs and pancakes. Location wise, we have selected riads within a reasonable distance of the main square (10 minutes walk or less) some of them are easy to find, others are located down small, winding alleys. As they are all small (with 6 rooms or less) they are also well-suited for groups wanting to rent an entire house for their stay. Please bear in mind that given how small the riads are, we may not always be able to offer you your first preference. If you normally prefer to stay in 2* – 3* hotels, then a riad in this range will be a nice treat, without breaking the bank. A modern riad located in the south of the medina, in the Riad Zitoun El Jedid area of Marrakech. Located half way between the main square and the Palais El Badi, the riad is well positioned to explore the main sights and it’s an easy 5 minute walk to the square. Compared to many of the riads in Marrakech, it is also relatively easy to find, accessed via a well maintained derb. The décor inside the riad is modern and cheerful and there is a small heated pool in the courtyard. There are 5 rooms altogether, including a family suite which has a double and twin room sharing a bathroom. The roof terrace has views to the Koutoubia and is decked out with sun loungers. - Communal areas: Roof terrace with sun loungers, patio, salon with tv. A small, 3 bed riad located in the Debachi area of Marrakech, about a 10 minute walk to the Djemaa el Fna. This riad has a lovely atmosphere, with a calming interior design and is a solid bet for a well-located, mid-range option. There is a cosy lounge and a lovely roof terrace where you can enjoy a tasty breakfast. Downstairs, there is a small, relaxing patio area and lounge with fire-place and a tv. The added bonus of this riad is that it is very easily accessed by road, meaning that you don’t have to walk down too many dark, winding streets once you have been dropped off – a real bonus for Marrakech. If you are travelling as a small group or a family, you could rent the whole riad, giving you a relaxing, yet affordable base for exploring the medina. A charming riad located to the east of the medina, in the Dabachi area of Marrakech, a short walk to the main square. As with many riads in Marrakech, it is accessed down an unlit derb (or street). Once you know where you are going, you won’t have any problem finding it, but the staff at the riad will show you the way to the square and will help you to get your bearings when you arrive. Inside, the riad has 4 air conditioned bedrooms, all en-suite and one family room that sleeps 4. The roof terrace has sun loungers and is private. The riad also benefits from a deep plunge pool and a hammam. At this end of the hotel range in the medina, you can expect to find clean and basic hotels offering cheerful, but no frills service. We have two hotels that we recommend in this category. Both are in an excellent location, just minutes from the square and convenient for late night drop offs. If you normally stay in hostels or basic accommodation and just want a bed for the night without the trimmings, then these are a solid option. This riad is located about a 5 minute walk from the central square, so makes for a great budget accommodation choice for late arrivals. The 24 rooms are all ensuite with showers, toilet, air conditioning and tv. The staff are friendly and rooms are clean. Communal areas include a pleasant roof terrace and patio.<br />- 26 rooms, including 2 x quadruple rooms, triples and twins / doubles. A budget option offering clean and basic accommodation, just 5 minutes from the main square. Rooms are ensuite with air con and there is a roof terrace with a view of the Koutoubia and patio area. - Twins and triples are available. Finding a riad to accommodate your family can be a difficult task, but there are some superb options in the medina for families of all sizes. Most riads will be able to add a bed to a double room to accommodate three people, so if there are just three of you in your family and you are happy to share, then you have a wide choice. Larger families can opt for family suites or may even consider renting a whole riad – prices can be very competitive and you don’t need to feel self-conscious about disturbing other guests. Do bear in mind that riads facilities are not particularly child friendly, especially for the under 5’s, so you will need to keep an extra close eye on little ones. Mid-range riads for families: Families of 3 / 4 will like the family room at Riad 107. The room has a mezzanine level that is accessed by a ladder, so this room is only really appropriate for children aged 6 + The mezzanine level can sleep one / two children and there is a double bed on the floor level. The riad benefits from a lovely roof terrace and also a pool. It is quite deep, so parents need to supervise young children. Families of 4 might want to consider the family room at Riad Diana – a double and a twin room sharing a bathroom. The riad also has a small pool, which can be very welcome in the heat of the summer. If you have a slightly larger family, you might want to consider renting a whole riad. Riad Dar Thania has three double rooms over two floors, with a lovely roof terrace and lounge. Enough space to spread out and to relax. Boutique riads for families: The Douairia Suite at Dar Vedra is one of our favourites. With a double bed on a mezzanine level and a twin (possibility for a triple) downstairs, this small apartment also has a separate lounge area with fire place and TV. The riad also benefits from a small pool, which is perfect for older children. Riad Bel Haj has 4 bedrooms and a small plunge pool, as well as 2 small lounges and a lovely roof terrace. The staff are really friendly and the location is very central, meaning it is one of the easiest riads to find. A perfect option for families of 5 – 8. Riad El Cadi is a luxury end riad in Marrakech, but within the riad they have the ‘blue house; which is a small two bedroomed house specifically designed with families in mind. There is a double and a twin room as well as a lounge (where an extra bed can be placed if necessary). The hotel also benefits from a pool. 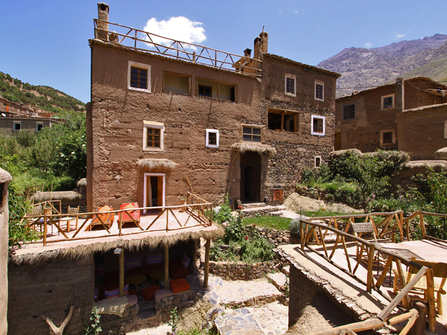 If you are exploring Marrakech after a stint trekking in the mountains, then you will have been staying in some basic gites or mountain huts and will be in need of some comfort. Riad Dar Hanane offers some lovely accommodation, with a gorgeous roof terrace with far-reaching views, decked out with sun loungers and comfortable seating. The 6 rooms are all beautifully designed and there are some cosy communal areas for winter evenings. The walk to the main square takes about 10 – 15 minutes through the souks, but if you get lost you can just call the staff and someone will come and bring you back. If you are traveling as a larger group, it is possible to rent a whole riad. For groups of up to 12 people looking for a boutique stay, Dar Hanane is a very good option. If there are more of you in the group, then you could look at Riad Tzarra, around the corner, which could offer an additional 4 rooms. If you are looking for a mid-range option, then Riad 107 has an interconnecting door with its neighbour, offering beds for up to 22 people with two small swimming pools and plenty of room to spread out on the roof terrace.